Thanks to UNIVERSAL PICTURES HOME ENTERTAINMENT. we have copies of BARBIE STARLIGHT ADVENTURE (Blu-ray + DVD + Digital HD) to giveaway to some lucky fans. Barbie™ is a cosmic princess who flies high on her hoverboard through a far-off universe with her adorable and devoted pet sidekick, Pupcorn. One day, everything changes when the twinkling stars start to dim and slow their dance in the sky. 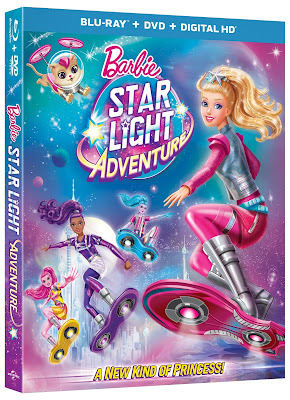 Barbie™ travels to a beautiful new planet to join a special rescue team on a mission to save the stars. Once there, she teams up with a group of talented new friends who work together to save the galaxy through exciting hoverboarding adventures. Barbie™ soon discovers that if she listens to her heart, and with the help of her friends, she might be the leader the whole universe has been waiting for!